Karl Collins DPM of St. Louis said he’s seen patients who came in for athlete’s foot, stubbed toes, puncture wounds, and ingrown nails leave with a diagnosis of MRSA. “If you have a cut or a scrape that gets infected and it’s not healing in a timely fashion, don’t hesitate to get it checked out,” he said. 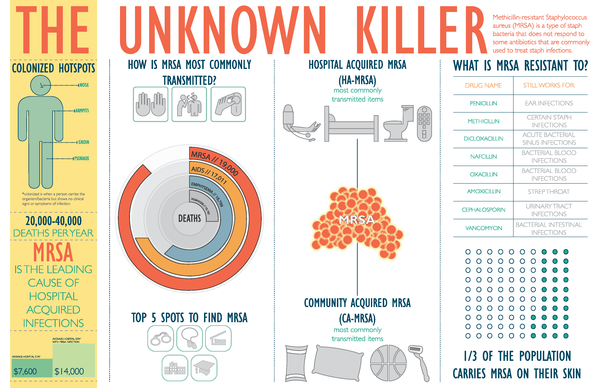 According to the Centers for Disease Control and Prevention, 14 percent of MRSA cases are community-associated, while the rest come from medical care settings. MRSA infections can be spread by skin-to-skin contact, by borrowing a personal item, or from a community surface to an opening on the skin. The CDC adds, “People may be more at risk in locations where these factors are common, including: athletic facilities, dormitories, military barracks, households,correctional facilities, and daycare centers.” In other words: MRSA is picked up in the same way as athlete’s foot. “Staph aureus is ubiquitous, it is everywhere,” Dr. Gregory Moran from the UCLA Medical Center told CNN. He adds that one-third of us are walking around with this bacteria in our nose right now, but it’s not affecting our health. However, there are different strains of MRSA out there — and some of the more aggressive strains can be toxic and fatal if they penetrate to internal organs. The first symptoms of MRSA involve a boil or abscess type wound that becomes red, swollen, painful and pus-filled. Often, this marking appears like a spider bite. Serious cases turn into fevers, shortness of breath, coughs and chills. Urinary tract infections commonly occur when the infection gets into the bloodstream or urinary tract. In rare cases, staph results in “flesh-eating bacterial infections,” which spread very rapidly across the skin. What Is The MRSA / Athlete’s Foot Connection? Keep all cuts washed and bandaged. Never try to cut or dig out ingrown toenails. Keep feet clean, dry and free from fungal infections like athlete’s foot. Sure, there are plenty of home remedies proposed for fighting infection — like coconut oil, for example. While these natural antifungals may help build resistance, they don’t actually kill off harmful bacteria. Sometimes practicing perfect hygiene is not enough. We find it’s best to not only keep your feet clean, but your shoes clean too. Don’t assume that porous socks will protect you from bacteria and fungus. If the air can get in, so can microscopic bacteria. Setting your shoes to disinfect with the American Podiatric Medical Association-recommended SteriShoe® UV shoe sanitizer for just 45 minutes each night can kill up to 99.9% of the harmful bacteria you come into contact with on a daily basis. There is no absolute guarantee of preventing a foot condition like MRSA or athlete’s foot, but we can all agree that keeping the foot as bacteria-free as possible is the best hope we have against these terrible infections! This brings up lots of questions for me. How long does it take to test for Mercer infection? Yesterday around 9am (8pm now) I went in for some type of staph infection on my leg and they tested to see if it was MRSA, then the doctor said he’d call when he gets the results, but he still hasn’t called. What’s the deal? How long does it take? Should You Buy Shoe Deodorizer? What Is A UV Shoe Sanitizer?